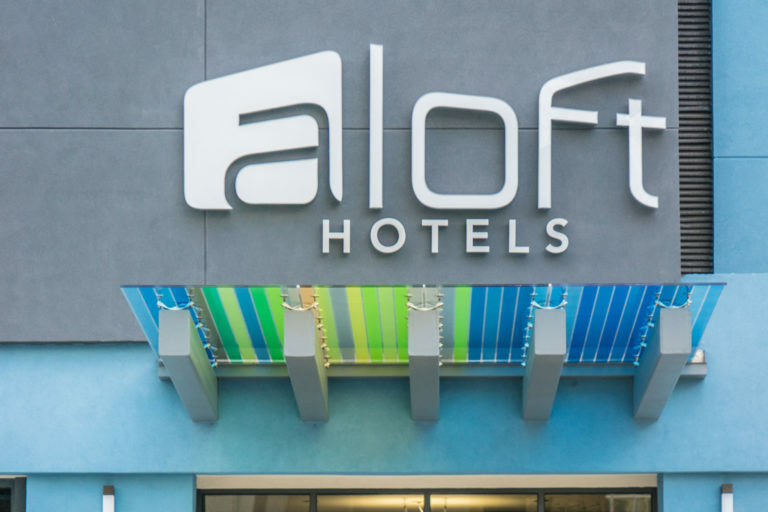 Glass + Mirror Craft’s Canopy Systems integrate any variety of glass and custom metal components into architectural systems surpassing functionality and safety requirements. 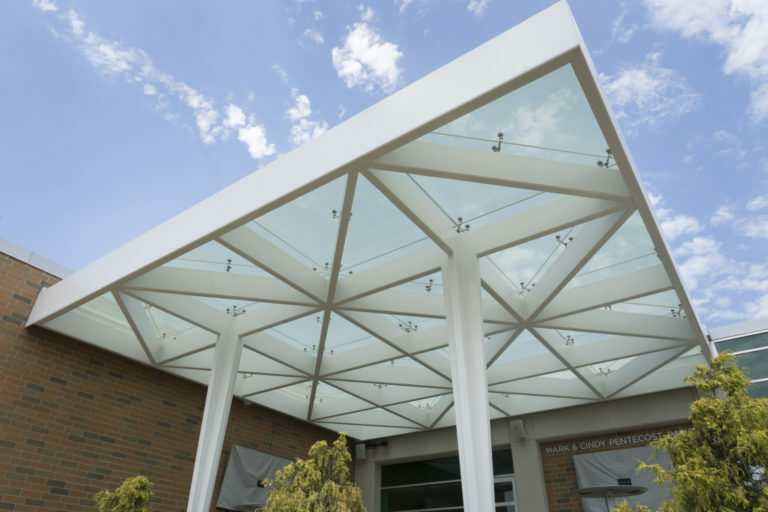 Glazier Lansing Glass Co. selected Glass + Mirror Craft to develop and deliver a powerful exterior glass canopy for The Michigan State University Breslin Center, home of Spartan basketball. The G+MC Engineering Department provided a complete architectural system of 32 triangular panels of custom tempered, laminated frit glass and custom attaching stainless steel hardware. The panels were printed to allow 50% light coverage creating perfect shade beneath the entrance on bright days. The stainless steel hardware was manufactured by G+MC’s Cuda Metals Division, operating on-site with glass fabrication resources. The system was delivered with stamped drawings and kitted to flow installation. 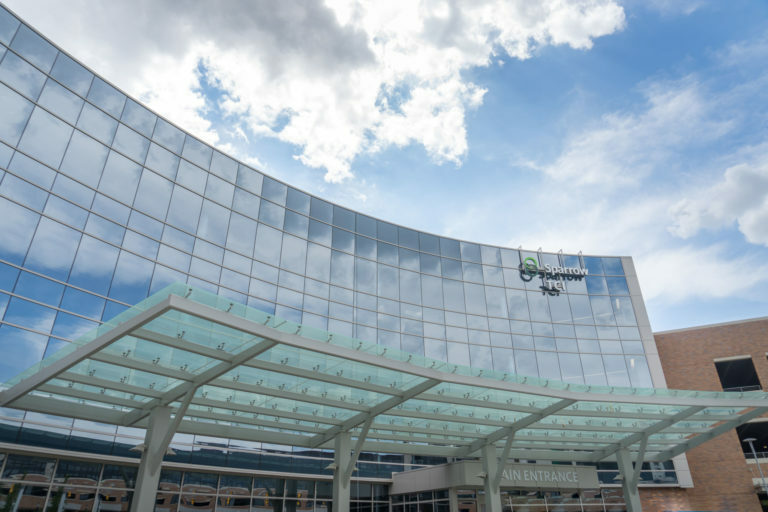 Glass + Mirror Craft was selected by glazier Lansing Glass Co. to deliver this dramatic 72,000 square foot exterior glass canopy covering the entrance of the Sparrow Health Center Lansing (Michigan) facility. Twenty-five panels of tempered, laminated frit glass curve gracefully through an 81-foot by 32-foot arc. 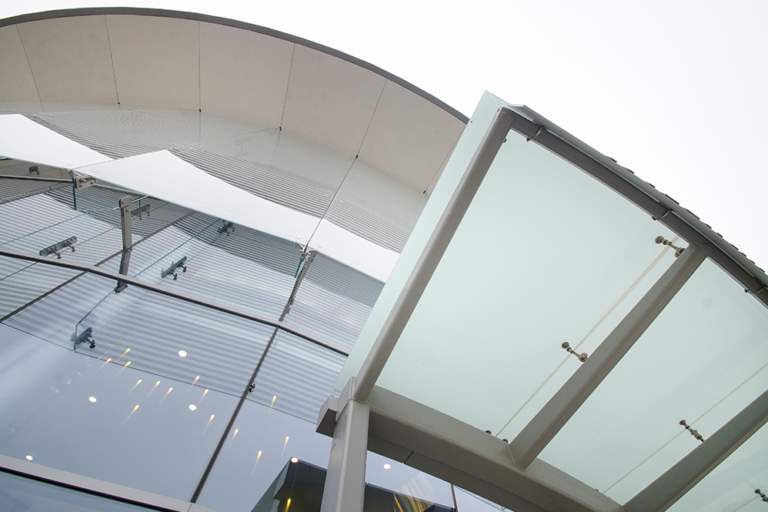 G+MC’s Graphic Design Group designed each glass panel such that the dot pattern on the glass stretched seamlessly across the entire canopy. G+MC Engineering designed the custom stainless steel hardware, which was manufactured in-house by G+MC’s Cuda Metals Division. 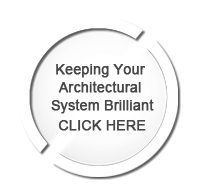 The entire architectural system came with stamped engineering drawings and was kitted to simplify installation. To update the University of Michigan Player Development Center, Glass + Mirror Craft worked closely with the UofM architect to deliver this complex architectural system including all glass and custom hardware. G+MC Engineering designed the system to integrate with existing structural components. The system included a frosted laminated glass canopy, structural glass screen wall, fritted glass, and a complete glass door system. Both the point supporting and attaching stainless steel hardware were designed by G+MC Engineering and G+MC’s Cuda Metals Division. Cuda Metals then manufactured the hardware components on site. The system was kitted for ease of installation and delivered with a full set of stamped drawings. The finished product is beautiful, functional, and built to withstand Michigan’s weather extremes over time. 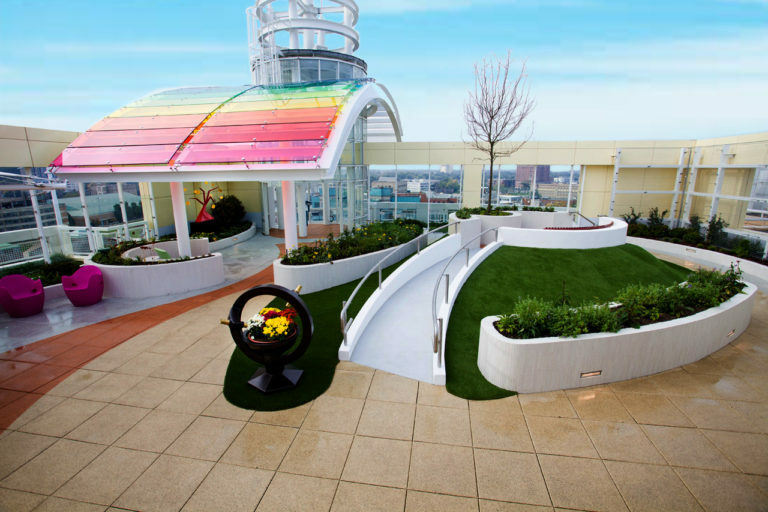 Georgia, the glass canopy is found on a 9th floor rooftop space. 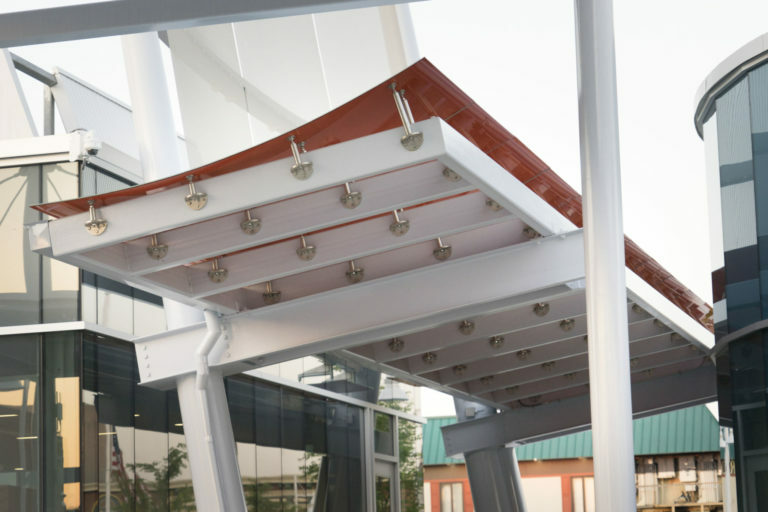 G+MC engineered the canopy design, along with the custom stainless steel hardware used to attach the glass. Both the tempered, laminated glass and metal hardware were fabricated on-site at G+MC operations in Wixom, Michigan. G+MC’s Graphic Design Group, also in Wixom, was instrumental in matching the panel colors to the architect’s vision. The canopy was packaged as a kit to simplify installation, and the entire architectural system was delivered with stamped drawings. 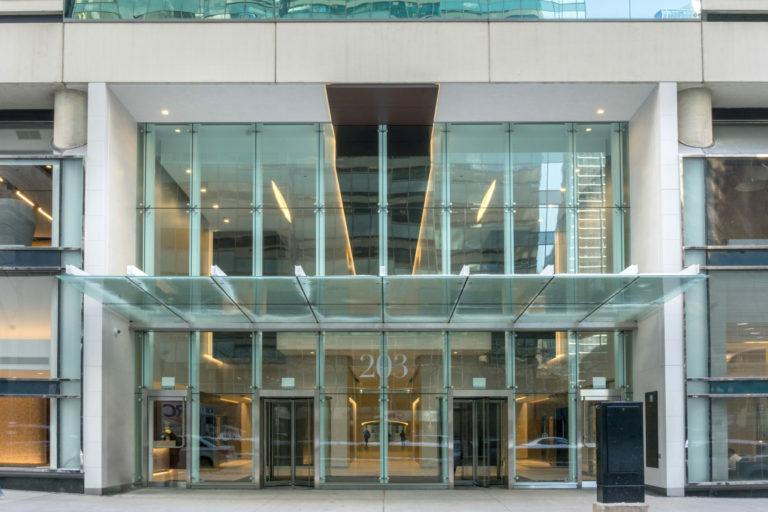 Glass + Mirror Craft was retained by Glazier Glass Solutions to provide the primary elements of the all glass entrance to the 203 North LaSalle office complex, including the exterior all glass canopy. The 16 tempered and laminated glass panels within the canopy thrust outward from the glass structural wall beneath custom stainless steel supports. The attaching hardware is also custom. The entire architectural system was engineered by G+MC, and delivered in kits with stamped drawings. All metal hardware was manufactured at Glass + Mirror Craft by it’s Cuda Metals Division. As part of this project, G+MC also provided the all glass entrance, all glass guardrails, and glass partitions separating a fitness center to floor traffic. Working with glazier Edwards Glass Company, Glass + Mirror Craft’ delivered functionality and beauty with this custom bent glass canopy for the Blue Water Transit Company in Port Huron, Michigan. This unique design required a unique solution and the engineering, glass fabrication, metals fabrication, and graphic design teams at Glass + Mirror Craft proved up to the challenge. As is the case with all G+MC architectural systems, the canopy was delivered with stamped drawings and in kits to flow installation. 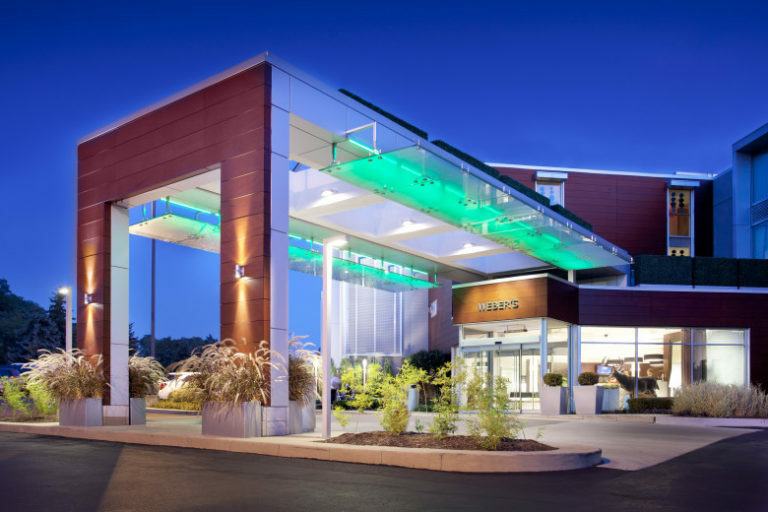 Glass + Mirror Craft delivered elegance and style to this glass canopy system for one of Michigan’s finest boutique hotels in Ann Arbor, Michigan. The tempered, laminated glass panels are attached with custom stainless steel hardware designed by G+MC engineering and manufactured by the company’s on-site Cuda Metals division. The entire architectural system was delivered with stamped drawings and assembled as a kit to simplify installation.